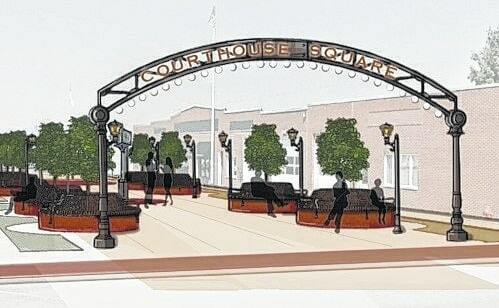 Shown is an artist’s rendering of the entrance to a proposed town square plaza under consideration by Hillsboro City Council, to be built where Gov. Trimble Place currently exists. The anonymous donor who gave the city more than $78,000 about 18 months ago said Tuesday he stands by his original intention that the money should be used at the mayor’s discretion, including for the building of an uptown plaza if that’s what the city decides to do. As reported last August, The Times-Gazette at that time requested and received from the city a copy of the letter from the donor, which included the man’s name. As was reported then, “The Times-Gazette has respected the donor’s wish to remain anonymous, but has examined the letter he sent.” Interviewed by telephone on Tuesday, the individual again asked not to be identified. The donation was in the amount of $78,168.64, and is from a private charitable trust that has a long history of philanthropic endeavors. The individual has been part of the Hillsboro and Highland County community for several decades. Once the money was given, the donor maintained no legal right to mandate how it is used, and even though on Tuesday he reiterated his hope that it would be used at Mayor Drew Hastings’ discretion, the mayor has acknowledged that council’s approval is needed before the funds are expended. The individual said Tuesday that he thought the plaza proposal was a positive idea. He said he hoped his anonymity would be preserved because he does not want attention or credit for the gift, and wants nothing in return. Council President Lee Koogler said the recommendation did not mean the town square was approved to be built, but that it instead expressed council’s decision to continue pursuing the plan and gather more detailed information about its overall impact. Morris said that “conceptual ideas” regarding the plaza would include additional parking spaces, and bricks used for walkways at the plaza, in keeping with the historic look. Morris said the administration is working to attract a hotel to the uptown area, and there has been “rapid progress” on developing uptown residential living with more people looking for uptown apartments, making it important to create entertainment venues in the area. She said the city has received reference letters from business owners and the Hillsboro Uptown Renaissance Project in support of creating an uptown plaza. She said funding the town square could happen through both private and public funds. She said the city has been talking with Paint Creek Joint EMS/Fire District, and Paint Creek has agreed to work out a plan to access equipment if the plaza is built. “Chief (Bradley) George does not anticipate this to be a problem,” said Morris. Pam Limes, Democratic candidate for mayor in November, was present at Monday’s council meeting. She has come out against the plaza, saying there are too many unanswered questions. She said last week that the city should hold a public meeting specifically designed for citizens to weigh in. She noted that the public meetings held by the plaza design committee were for discussion of the design, not whether people wanted the plaza. “We need to have a true public meeting,” said Limes. She said no one has yet presented a plan spelling out how much the plaza will cost, that no plans have been made in regard to what will happen to the Paint Creek fire department’s ability to access the south-facing bay door that now enters onto Gov. Trimble Place, where the proposed plaza would be built. Limes said that despite claims that the plaza would help businesses in the uptown area, there is “nothing that proves that,” such as a formal study. “There is too much we don’t know to make an informed decision at this point,” she said.